I finally got my deck painted last week-end! Let me know what you think! I love comments! I also love for you to follow me! I hope you enjoy! 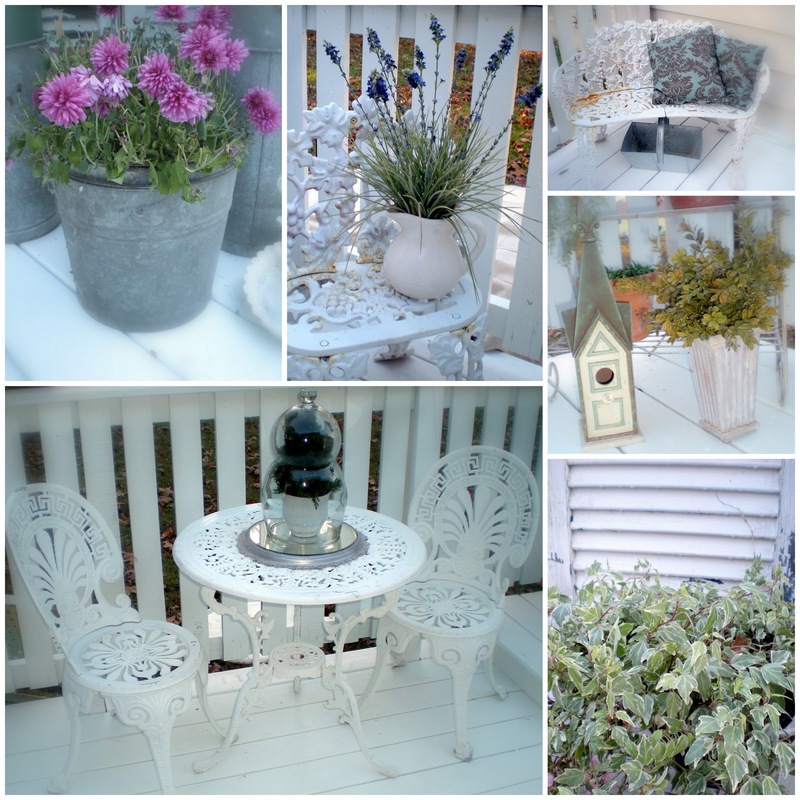 I went with a white-on-white overall theme, pulling in hits of color through plants, accessories, and galvanized tin. Of course, there is plenty of crusty, chippy, cast-iron furniture--softened with some outdoor pillows. Faux birds, birdhouses, plants, and a large garden finial round out this corner. French flower buckets and galvanized pails full of flowers. A lovely teacart ready to serve up a drink or two! I love the chippy patina of the table and plateau mirror. Crystal and mercury glass decanters, a vintage silver tray, fluted stemware, and a miniature rose bush in a white urn make a beautiful vignette. Lush ivy grows with beautiful weathered shutters peeking through. Mums make an appearance sprouting from the tops of vintage French flower buckets. Have a seat; we can while away the hours enjoying the beautiful 70 degree November weather! I pulled all these accessories from around the house! No need for anything new other than paint. Nearly everything came from yard sales, antiques shoppes, or thrift stores. An exception is the tea cart--it came from a big-box store (not sure where). This was a birthday present--it was originally shiny and black--I couldn't leave it that way--so out came the white spray paint! I hope you've enjoyed your visit! Be sure to check back soon! Lots more to share! Christmas is coming!